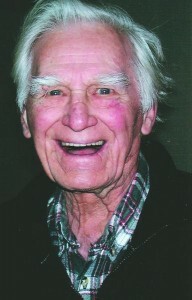 Jesse A. Fithian, 98, formerly of Northern Area Homes, Russell, Pa. died Saturday evening, November 5, 2011 at the Warren Manor after a brief illness. He was born September 8, 1913 in Butler, Pa. to the late James Herbert and Carrie Mae Parker Fithian. He has resided in Russell since 2001 and was formerly of Parker and Titusville, Pa. He was a graduate of Parker High School Class of 1932. Coming from a very musical family, Jesse took trumpet lessons as a child. In his high school years, he had his own band called the “Star Dusters”. He played with the Butler Symphony Orchestra and many other musical groups after he was discharged from the service. His love of music lasted throughout his lifetime. Jesse served as a Sergeant Technician 4th Grade, 82nd Army Ground Forces Band from April 4, 1942 to December 22, 1945. Some of his duties included playing marches for military formations, occasional bugling and playing in the dance band for the USO. Jesse was employed with the former Glass Containers Corporation retiring from there after forty years of service. He was a member of the Parker United Methodist Church and attended the Russell United Methodist Church. He was a sixtyyear member of the American Legion Post 598 Parker, PA. He was a 32nd degree Mason with the Coudersport Consistory and home Allegheny Masonic Lodge #521, Parker City. He was also a member of the Connoquenessing Lodge 278 of the I.O.O.F. for over fifty years. Jesse spent his retirement years enjoying nature while riding his bicycle on trails in Western PA. He moved to Titusville to be closer to the Oil Creek Bike Trail, which he rode almost every day. Even at 91 years of age he rode his bike three to five miles a day on the North Warren Bike Trail. He made many friends on his rides. He is survived by one son, Brad W. Fithian and his wife, Kathleen of Russell, Pa., one daughter Lauren Johnston and her husband, Daniel of Kane, Pa., one sister Betty Smith of Washington, D.C., one brother Richard Fithian and his wife, Alma of Beaufort, S.C., four grandchildren, Stacey (Shannon) Powell of Langhorne, PA., Bryan Johnston of Raleigh, N.C., James and Kristina Fithian of Russell, PA., three greatgrandchildren Sydney, Shaelee and Stone Powell, and several nieces and nephews also survive. In addition to his parents, he was preceded in death on August 25, 1971, by his wife, Bettye Florence Wilkes Fithian whom he married June 25, 1945 in Louisville, Ky., four sisters Maude McIntire, Helen Ramsey, Sarah Jane Fox, and Florence Parker Krathge and one brother Herbert R. Fithian. Friends may call at the Donald E. Lewis Funeral Home, Inc., 304 East Street, Warren, Pa. on Wednesday from 2 to 4 and 6 to 8 p.m. where a funeral service will be conducted on Thursday at 11 a.m. with Rev. David Heckman, Pastor of the Russell United Methodist Church, officiating. A committal service will be conducted Thursday at 2:30 p.m. at the Parker Presbyterian Cemetery, Parker, Pa., where full military honors will be conducted. Those wishing to place memorials may do so through the Russell United Methodist Church, Box 28, Russell, Pa. 16345 or Hospice of Warren County, P.O. Box 68, Warren, PA. 16365. Sending the Fithian and Johnston families deepest sympathy for the loss of Jesse. He will be in my heart and memory always. We send our deepest sympathy for your loss. We loved Uncle Jesse. We will keep you in thoughts and prayers. Sending love and prayers for comfort to Lauren, Brad their familes and all family members! So many beautiful memories! Uncle Jess lived life fully reading his accomplishments and activities at a young age of 91 is so amazing! May the memories, love and support of family and friends bring comfort to each of you. So many beautiful memories! Our thoughts and prayers will be with all of the families. It was so good to be able to be with Jesse, Brad and family while Jesse was still able to recognize us. Even though we seldom saw him, it was always good to know that he was there and had such great care. The music was such a big part of the Fithian Family. May God be with you all. Much love to all. You have my deepest sympathy. I have great memories of Jessie and family. Our most sincere sympathy to Brad, Lauren and their families on the passing of Uncle Jesse. He remains in our hearts and prayers. God Bless. Griswold Special Care was honored to be in Jesse’s life.Please know that you and your family are in our thoughts and prayers. Uncle Jesse was such a special man. When I think of the many happy memories, I always think about his big smile that lit up a room. He always talked about his cycling, but I didn’t know he was able to do it until age 91! What an inspiration. My condolences to Brad and Lauren and their families. You’ll be in my thoughts and prayers. Love and prayers to Lauren and Brad. You were blessed to have a wonderful father….and mother. I am so grateful to have such happy memories of your parents and their kindness to me. God Bless You and your families. Dear Lauren & Family – So Sorry to learn of the passing of your Father. With sympathy and prayers to your Family.